An Indian Astrological reading, one based upon a detailed analysis of the birth chart, can be an invaluable tool for healing. It can pinpoint the karmic origins of health issues, explain the role of emotions and mental patterns in influencing the physiology, and provide essential information regarding the timing of events, past and future. Western and Indian astrologies share similarities, and also some important differences. Western astrology is considered more psychological, while Indian astrology is more predictive. There are many different systems and sub-systems. 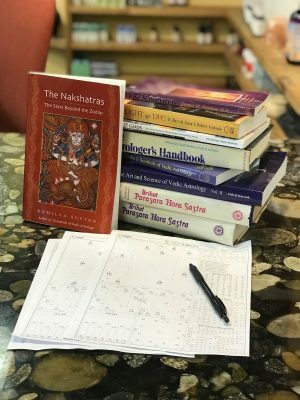 The Indian astrology practiced at New Leaf, by Dan Hendricks and Sagar Hallal, is from the lineage of Ernst Wilhelm – traditional Parashara Jyotish, using the Tropical (Western) zodiac, not the Sidereal zodiac as typically used by Indian astrologers. Dan Hendricks has also studied extensively with Ryan Kurczak, and is quite learned in the technicalities of the Parashara and Jaimini systems. Many people have found great value, and indeed, profound relief, from gaining insight into their inborn karmas. When we understand the energies we came into the world with, we can begin to change how we use them, and how we relate to them. Astrology is a great step towards becoming the masters of our own destinies!